I can't believe, ok maybe I can, that I forgot to post this recipe that I made a few months ago. My thoughts on it are YUM! What I learned from making my first risotto from scratch: When the recipe says to cut into small pieces, DO IT. I don't think the taste would had been as strong if I had cut the pumpkin pieces into smaller bits. I do this a lot when cooking, take shortcuts like the cutting. I learned my lesson! I also learned that my family does not like risotto. 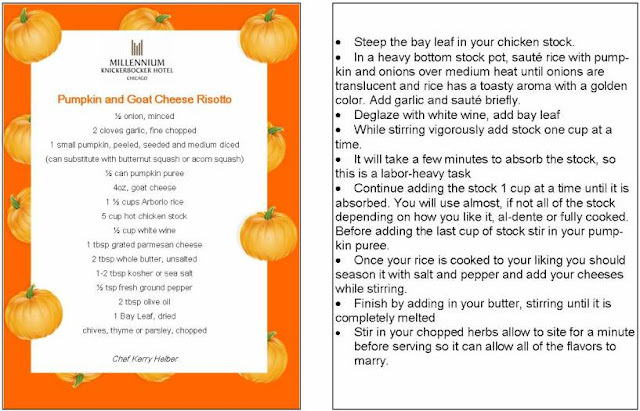 This recipe also produces A LOT of risotto. For my family of three, I should make a half recipe at most. Of course now I need to figure out what a single serving looks like. If you make this recipe, let me know how it turns out for you!